Wasps - friends or enemies? As autumn fades towards winter, female wasps (queens) that have successfully mated will see a suitable place to hibernate. Almost any cosy spot will do, be it in the ground, in a wall or in a shed or house. They adopt a pose with the wings folded alongside the body and legs positioned protectively over the wings. This may be to protect the wings or it may be to hold the wings [image] closer to the body for some thermal protection. Most queens will not survive the winter. Some will simply succumb to low temperatures, many will be found by predators such as spiders. The few that do survive will emerge in the spring to form new colonies. However, weather plays another cruel trick - a mild winter and an early spring may bring the queens out of hibernation before there is food available. A harsh and prolonged winter will cause many to die during hibernation but the survivors will emerge later, find food and get on with the business at hand. It has been found that these more robust survivors actually produce larger and stronger broods so a severe winter will generally produce more, not less, wasps than a mild one. On emerging, the first task of the queen is to find nectar-bearing flowers for food to build up strength. The next task is to find a suitable spot to build the nest. The site chosen, like the choice of hibernation place, may be almost anywhere. Some will go underground, some into wall cavities, some in bushes, inside or outside sheds and outbuildings or in your house. A site may be deemed suitable if it is warm but not hot, sheltered from the worst of the elements and reasonably secure against predators. 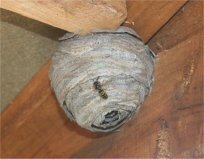 The queen wasp will scrape thin shavings from decaying (but not rotten) wood, chew it to a pulp and start building. A typical 'football' nest will start with an anchor point, then a central core and finally an outer coat. The structure may seem flimsy but the material, akin to very dry paper, actually has considerable strength. A small number of cells are now built and one egg placed in each. 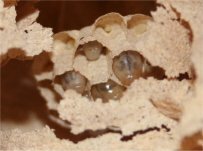 The queen will continue expanding the nest until the eggs hatch into grubs and she will continue to feed on nectar at this point. Once the egg hatches, her attention will now be diverted to looking after the grubs. She has little time for foraging for food for herself but nature has a trick up her sleeve - the grubs excrete a liquid that is rich in sugars, similar to honeydew, so she can avail herself of this ready source. It is commonly thought that wasps feed on small insects. They do not - they do not have a digestive system to do so. But the grubs do have such a system. The queen wasp will gather small insects (and aphids are ideal), chew them to form a pulp and feed this to the grubs. This is a wonderful bit of recycling - put grub food in at one end and get adult wasp food out the other! A common question is - are the nests dangerous? There can be no categoric answer. Generally speaking, unless the nest is likely to be interfered with then it probably is not. If nests are approached slowly and with no sudden movements, the occupants do not feel threatened and can actually be extremely tolerant! However, if pets or playing children are around then there is a real danger to them and it may then be wise to have the nest removed. Eventually the grubs are ready to turn into real wasps. The cell is closed while the transformation takes place and the new wasp finally chews its way out to join the queen in the big world. These new wasps are all female but are infertile. They are commonly called 'workers' and that is indeed their only role in life. They take over nest building duties from the queen, forage for food and attend to feeding of the grubs. They too find a ready food source from the fluids excreted by the grubs so their foraging outside is almost entirely spent in finding insect food to bring back to the nest. It has been estimated that, for a good-sized nest, a few tons of insects, mostly aphids, will be caught in a season - very good news for gardeners! This whole cycle continues through the summer, an individual wasp may have a lifespan of only 2-3 weeks but there is a steady supply of replacements. With every hatch of new wasps, the workforce gets larger and the nest will enlarge at an ever-increasing pace. At the peak of the season a nest can contain anything from a few hundred to quite a few thousand individual wasps! In autumn, the life cycle enters a new phase. The queen starts to lay a different type of eggs. Until now, her eggs produce only infertile females. Now they are eggs that will hatch into both male (drones) and fertile female wasps. They are not 'workers' and will leave the nest completely to mate and start next year's population. Food is now scarce, the males will soon die off and the females start looking for places to hibernate. Male wasps, incidentally, do not possess the ability to sting. Back in the nest, the queen is becoming exhausted and will lay the last of her eggs before dying. The 'friend' period is coming to an end. Once the last of the grubs turn into wasps there is no longer a source of food readily available from the grub excretions. There is a mass exodus from the nest as the remaining workers now have to forage for whatever food they can find for themselves. We start to see large numbers of wasps around us. Being unable to digest insect prey they will look for anything with a sweet smell may be a potential food source. What is very annoying is that they are strongly attracted to drinks containing sugar or titbits with jam on. Guaranteed to take the edge off the pleasures of a picnic, barbecue or outdoor leisure on a balmy day! One partcular hazard is that they may go into opened drink cans unnoticed - this can prove to be an extremely unpleasant surprise for anyone taking another drink from the can. The list also includes humans, especially as we tend to use products such as scents, deodorants, aftershave, etc, in an effort to make ourselves 'smell nice' and if we smell nice to other humans then we will smell nice to the wasps too! Unfortunately, with food becoming scarce, the wasps become more persistent and quite irritable as well so are more likely to sting. Perhaps worst of all, they have a fondness for fallen fruit. With fermentation taking place as the fruit rots, the fruit is somewhat alcoholic and wasps become inebriated. Like many humans, the drunken state often results in them becoming very aggressive. The end of the 'pest season' can occur quite rapidly. Wasps have a lifespan of only 3 weeks at best and so they will be dying off naturally while the lack of food will starve others to death. An early frost will kill off the remainder. The wasp season is over - but is it? The hibernating queens are there for it all to start again next spring. So are they friends or enemies? Unlike bees, they contribute little, if anything, towards pollinating our plants. They do, however, play a very significant role in controlling aphids. Therefore, if we can learn to live with the sudden proliferation of wasps in the autumn, then they are unquestionably friends!